This is what you see when you get to the top of Mount Hallowell – an old, weathered fire tower that used to be used to spot fires. This is the view of Sakinaw Lake and beyond from the top of the mountain. When you are at the top if you explore a bit you get 360 degree views. 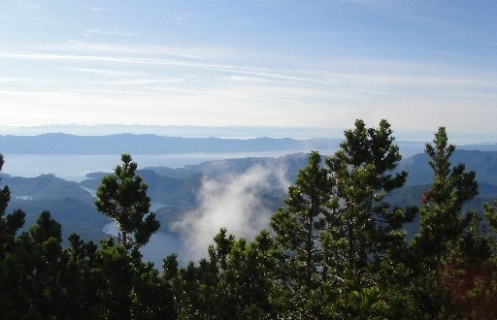 This is the view of the Sechelt Inlet from the backside of the peak. 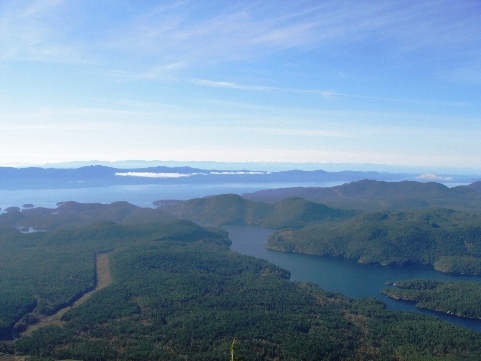 This is the view looking down at the Pender Harbour area from the top of the mountain. Mount Hallowell is a strenuous hike in the Pender Harbour area. It’s a great workout hike because you gain an elevation of approximately 1,050 metres (3500 feet) if you begin the hike where I did. At the top of the mountain – right on the peak – is a forestry fire tower. Be careful around the building as there is a lot of broken glass which could easily cut a dog’s paw. There are two ways to get to the trail head for Mount Hallowell. The way I chose is via the Malaspina Substation Rd. in Pender Harbour. This is the best choice if you don’t have a 4 wheel drive. It means that you have to hike approximately 8 kilometres each way, but the alternative route is via Trout Lake Rd. in Halfmoon Bay. This route requires a 4 wheel drive vehicle and you have to follow the road for approximately 19.5 kilometres and then hike in the trail. It cuts off about 12 kilometres total from the hike, but requires a lot of 4 wheel driving. Coming from Sechelt, follow the Sunshine Coast Hwy. (Hwy. 101) approximately 5.6 kms past Garden Bay Rd. (PetroCan gas station is on this corner). Turn right on Malaspina Substation Rd. and follow the road about 1 km under the power lines. You will see a sign post for the Suncoaster Trail on your left and once you pass this sign you are actually following the Suncoaster Trail. Turn right at the road just before the Substation (not the first one on your right – that one goes under the power lines). You should see diamond markers along the way indicating you are on the Suncoaster Trail. Follow this rough road about 1.6 kms to a fork. The trail/road on the right goes towards Madeira Park and is the continuation of the Suncoaster Trail. Park here. Head up the gravel road (you are not going to follow the Suncoaster). If you have a 4 wheel drive you may be able to continue on this road as far as the washout (approx. 2.4 kms), but with a 2 wheel drive you should not try driving up. As you hike up this road you will come out to a clear cut area and you will see the road forks to the left or continues to the right. You stay to the right. After about 2.3 kms you will see a trail/atv track that cuts into the bush and up the bank on your right. Do not turn here, as this goes to the reflector dish on the side of the mountain above the Substation. Keep going straight up the road and you will very shortly cross an area of the road that has washed out. There is a creek that flows across the road here, but it is generally easy to cross. Follow the trail and you will keep climbing for a couple of kilometres through a couple of areas where some small poplars border the road. After the spring melt these trees are often leaning after being weighted down with snow in the winter months. Up the hill and take a left and cross a cleared area with a small pond and stream to the final piece of road to the trail head. At this road turn left and keep going for about 1.5 kms until you see some ribbon markers at the trail head on your left. There is also a small rock cairn that marks the spot. Turn left onto the trail to Mount Hallowell which winds through the forest. The first 10 or 15 minutes of this trail actually meanders up and down and is really quite a pleasant stroll. 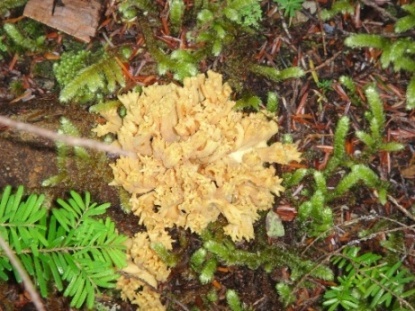 Coral mushroom found alongside the trail on the way up. There are a couple of large trees that have blown down (as of October 2011) that haven’t been cleared away so you will need to climb over them. This next part of the trail is wet, muddy and overgrown in places. Keep your eye on the ribbons and you’ll stay on track. The trail is well marked with ribbons. Once you are past the wet, muddy areas you really start to climb and this last section of the trail is pretty much straight up the mountain. From the trail head to the peak is about a 200 metre elevation gain. It will likely take you between 30 to 60 minutes to get to the top of Mount Hallowell. The view looking down at Sakinaw Lake from the tower. Take Hwy. 101 (Sunshine Coast Highway) about 11 kms north of Sechelt to the second entrance to Trout Lake Rd. (at the bottom of the big hill just before the north entrance to Redrooffs Rd.). Turn right onto Trout Lake Rd. The road becomes gravel and you will pass under the power lines. At approx. 3 kms the road curves to the right or keeps going straight. Do not go right, but follow the road straight ahead. You are now on the Halfmoon Carlson Forest Service Road. After about approx. 1.5 km you will come to another intersection that branches left and right. Keep going straight. In another 2 kms or so the road branches right (this branch will take you to Carlson Lake). Again you keep left going straight ahead. Along the way you will see other branch roads on the left and right, but you keep going straight. The road will pass under a bigger set of power lines and about 1 km further along you will see a Provincial Park sign on the left. Immediately after that a road branches off to the left. Take this road. It is almost exactly 15 kms from where you turned off Hwy. 101 onto Trout Lake Rd. to this point. Approximately 4.3 kms along this road you will come to another fork. One road goes off to the right and starts to climb. It actually looks like the more traveled road, however you want to keep left. In another 2.5 kms (approx.) the road forks again. Keep right here and it is another 1.5 kms (approx.) to the trail head which will be on your left and is marked with ribbon. From here you can follow the directions above to the peak. 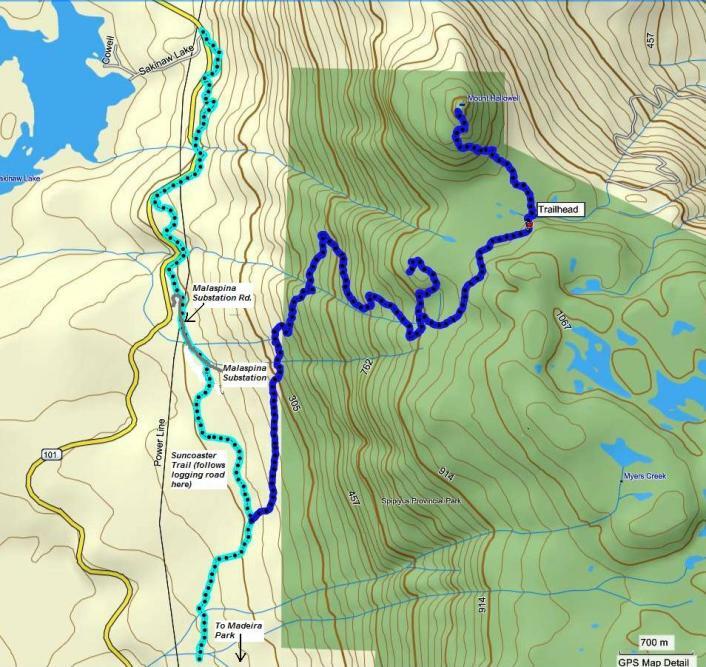 Click here to return from Mount Hallowell to the Hikes and Bikes page. Click here to return from Mount Hallowell to the Sunshine Coast Trail Home page.